Your exam results are a distant memory and you’ve landed your dream gig (sorta). You’re feeling ready to enter the world of work and finally making some cold hard cash. But what do you need to do to keep the job, be well-liked by your peers and work your way up the corporate ladder? We’ll save you the blood, sweat and tears with these, oh-so-simple tips. You can thank us later! The thing about having a job is that you have to actually turn up. There will be many days where your alarm goes off and you genuinely contemplate setting yourself on fire rather than go to work, but to get that fat pay check at the end of the month, you sorta need to show up. 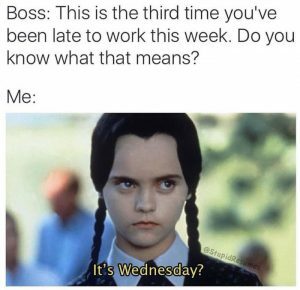 It’s also important to be on time. So if you start at 9am, you should be getting into the office no later than 8.50am. If you find you’re running late, make up the time by working over your lunch hour or staying behind after work. Nobody likes a slacker. What you wear says a lot about the type of person you are. 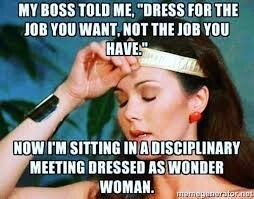 You should aim to dress for the job you want, not the job you have. Envision the career you’d most like to have and start dressing accordingly. Note, turning up at a law firm in angel wings and lingerie is probably not the best idea when it’s blowing a hoolie. Damn IOM weather. 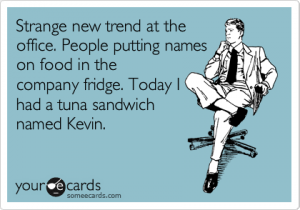 One thing you will notice about working in an office is that people are very territorial over their food. (And don’t get us started on cup politics.) You may feel like you’re reverted back to primary school when you open the fridge to an array of food with people’s names on, but you’ll soon find yourself joining in when somebody dares eat your last sausage roll. 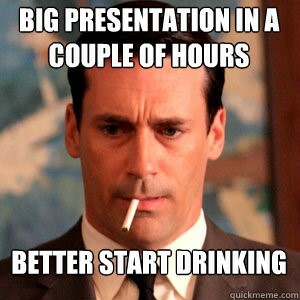 If you’ve imagined the world of work to be like a scene out of Mad Men, you’ll be sadly mistaken. Boozy lunches and boardroom drinks are (mostly) a thing of the past. In the midst of a dramatic breakup? Fallen out with you bff? 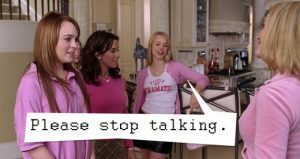 The office is not the time to start having loud, dramatic phone calls or ranting and raving to anybody who will listen about it. Your colleagues will be more likely to respect you if you keep a certain boundary level between your personal life and work life. They probably don’t need to hear the full weekend antics, just the edited highlights (with any drunk incidents swiftly omitted, especially the part about drunk dialing your ex). Want to make work absolutely excruciating for you and your colleagues? 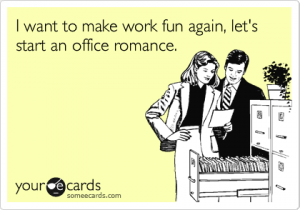 Start an office romance. While it might seem fun and harmless at the time, it’s unlikely anything good will come out of the situation. Be warned – the Christmas party is rife with embarrassing affairs. Don’t be one of those people who snogs the (married) boss and has to start job hunting all over again because they can’t bear to face anybody at work afterwards. If you haven’t yet secured your first job, we can help you find it. We have a huge variety of job vacancies waiting for the right candidate – many who are looking for school leavers like you. Take a look online or give the friendly team at Ambitions a call on 614841. Don’t fall into these three career traps this autumn Is your interview technique scaring away potential employers?